"The security certificate presented by this website was not issued by a trusted certificate authority." The web site is using a self-signed certificate. Self-signed certificates can be generated for free but they don't provide as much trust as a commercial certificate. You can tell your browser to trust the self-signed certificate or you can buy (or ask the site owner to buy) a trusted SSL certificate from a certificate authority. The web site is using a free SSL Certificate. Free SSL Certificates are issued by a couple of free certificate authorities but their Root Certificate must be manually imported to each browser to get rid of this error. 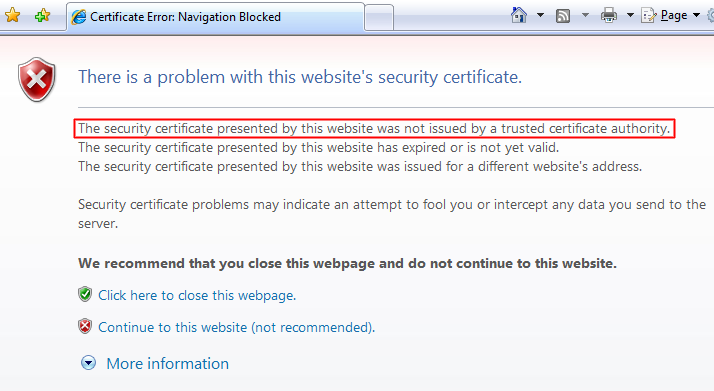 The web site is using a trusted SSL certificate but it is missing a chain/intermediate certificate. Most trusted certificates require that you install at least one other intermediate/chain certificate on the server to link your certificate up to a trusted source. The last option is a very common one. For example, if PayPal installed their server certificate for www.paypal.com without installing VeriSign's Class 3 Extended Validation SSL SGC CA intermediate certificate, a web browser would give the certificate not trusted error. Occasionally, certain browsers will give this error when others do not. For example, Microsoft Internet Explorer can automatically download intermediate certificates the first time you visit a site that needs one while Firefox cannot. 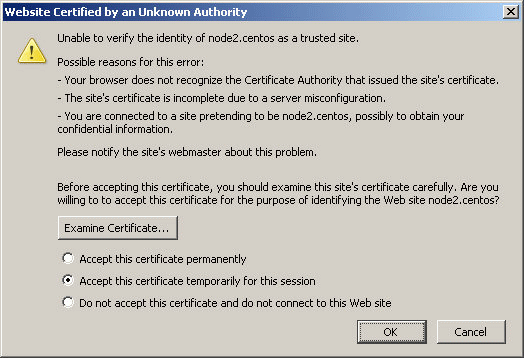 Once a trusted certificate is installed properly, all browsers will work without getting this error. You can verify whether the certificate will get a certificate not trusted error by using our SSL Checker. The SSL checker uses the latest roots included in Mozilla's Firefox to determine if a certificate is trusted. For specific compatibility of your certificate see, SSL certificate compatibility. Most web browsers make it clear that you shouldn't just continue when you receive this error. This is because, while most of the time it doesn't, it could indicate that a phisher is trying to pass a website off as a legitimate site. You shouldn't have to continue through this error message on legitimate web sites unless the web site owner just doesn't want to spend a little money to buy a trusted SSL certificate. You definitely shouldn't continue through this error on big websites like your bank. 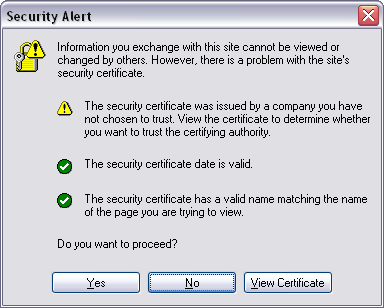 Internet Explorer 6 "The security certificate was issued by a company you have not chosen to trust. View the certificate to determine whether you want to trust the certifying authority." Internet Explorer 7 "The security certificate presented by this website was not issued by a trusted certificate authority." "Unable to verify the identity of www.paypal.com as a trusted site. - The site's certificate is incomplete due to a server misconfiguration." 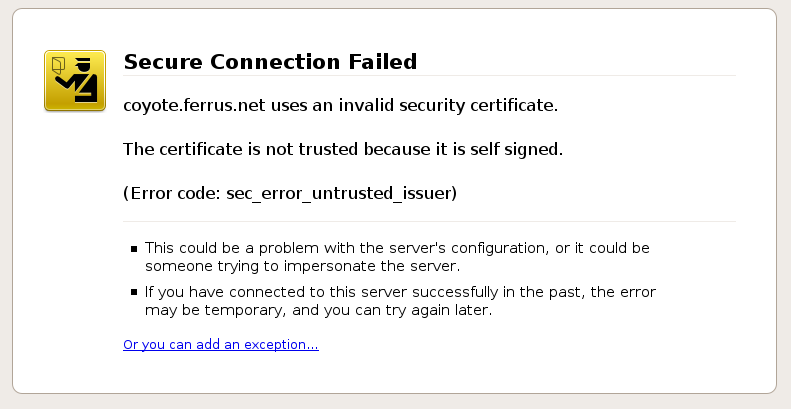 "The certificate is not trusted because it is self signed." "The certificate is not trusted because the issuer certificate is unknown. (Error code: sec_error_unknown_issuer)"
Safari 3 "Authentication failed because the server certificate is not trusted." 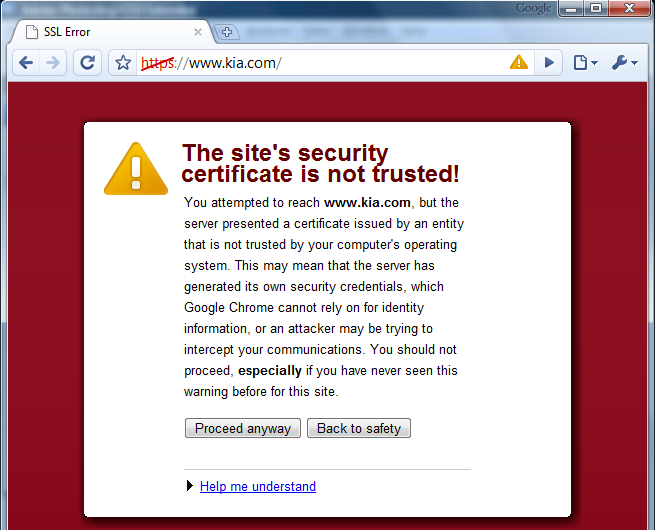 Google Chrome "The site's security certificate is not trusted!"